While Fulton County is known to have brutally hot summers, our winters are no walk in the park. With temperatures reaching the teens a few times each winter, it is important to have a reliable HVAC contractor for your heating and furnace repair Fulton County needs. If your heating equipment no longer works or is due for some repairs, contact your neighborhood experts at Cool Masters Heating and Air. Having served Atlanta and the surrounding metro area for years, you know what to expect when you schedule an appointment. Our Fulton County HVAC technicians arrive on time and treat you like a friend rather than a customer. With a licensed team of heating professionals, you can rest assured you will receive the superior Fulton furnace repair service you deserve. From general maintenance and repairs to equipment installation, we have all you covered. If your power bills have been higher than normal, you may be due for a heating tune-up. 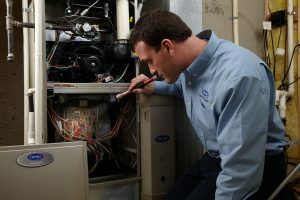 We can inspect your furnace or heat pump and make any adjustments so it runs as efficiently as possible. This service also prevents minor problems from turning into major, costly repairs. Whether you live in Downtown Atlanta, Roswell, Alpharetta or anywhere in between, you can count on Cool Masters Heating and Air for reliable furnace repair in Fulton County. If you have any questions or concerns, please feel free to give us a call! Your trusted source for Fulton heating, ventilation and air conditioning.